Unfortunately, the busier I am with gigs and presentations on Skylab (such as the recent Pecha Keucha for Art Is Just A Word at the Oxford Hub) the less time I have for this site and for photography. However, I managed to find time last night to develop a roll of Ilford HP5 400 ASA that’s been sitting on my desk for a few weeks. 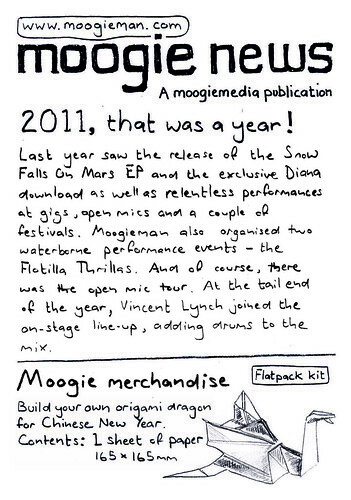 It might not seem like it given the lack of updates recently, but 2012 has got off to a busy start, as should be apparent from the latest edition of Moogie News – the pre-hot metal type newsletter. 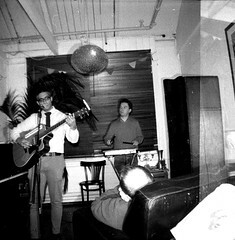 Get your copy at Moogieman’s regular open mic appearances: Catweazle, The Harcourt Arms, George’s Jamboree and the Firry Mic. Or make a samizdat copy off a friend, or get in touch with Moogieman (preferably from a public phonebox) to arrange a pick up.